Yum Yum Yu: Mini Bramley Apple "Pies"
My parents are all about Organic fruit and veg, for me it's just a label. They say Organic, but how do we know it's actually organic? Yes, I am being cynical, only because we have spent many years consuming vegetables that have not been given that label and then all of a sudden they label the ones with less (not completely free of) pesticides as "organic" and charge a lot more for them. Anyway, the parents decided to pay their good friend a visit at their stately home that has beautiful gardens and home grown produce. The two little monsters went with them too and it was great seeing them experience picking their own fruit and veg - by the looks of it, they had a ball! They had picked many things like: blackberries, marrows, plums, broad beans and bramley apples. 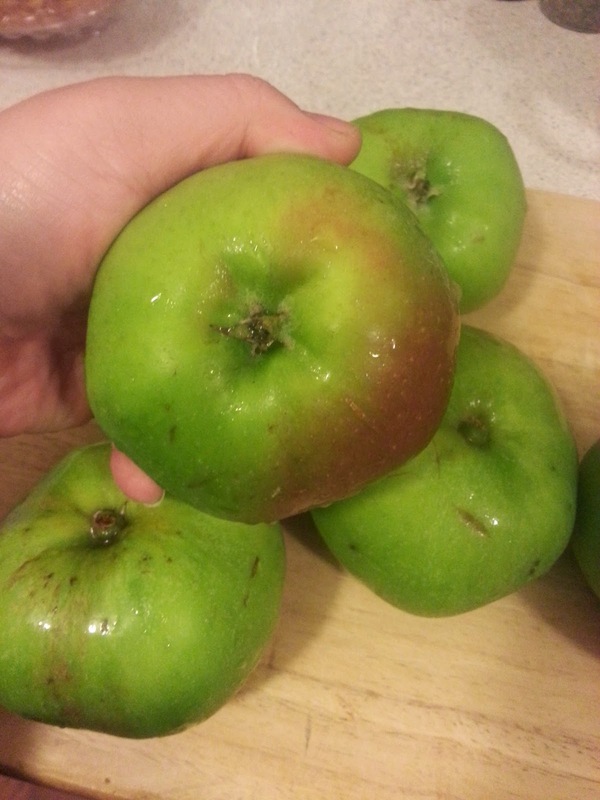 Bramley apples are very popular for using in pies, tarts, making apple sauce etc. Just not eaten though - they are pretty sour! I'm going to be honest here - I don't like apple pie. In fact, I don't like much (if any) cooked fruit so deciding on how to use over a kilo of these apples was a challenge and a half. I have been trawling the trusty internet for ideas and I finally decided I would try making different things with it. First up: mini apple "pies". Most apple pie recipes don't cook the apples first but me being me, I feared the apples wouldn't cook enough so looked for a recipe that required the fruit to be cooked prior to baking. I also have a confession. I used shop bought pastry. Yes yes yes, totally sinful but guess what, I don't have the luxury of time to make pastry from scratch. 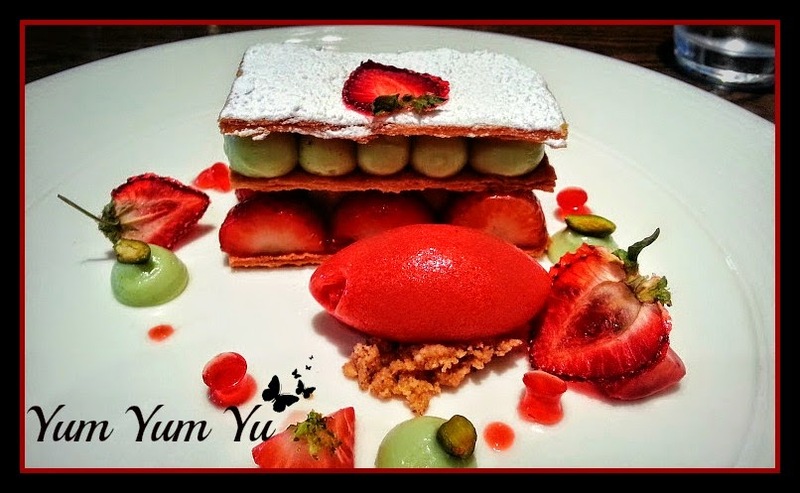 I would if I had more time - which will happen soon, so there may be a post on pastry testing! After making these mini apple "pies" there were obvious tweaks that I will probably do next time but they weren't too bad for a first attempt. 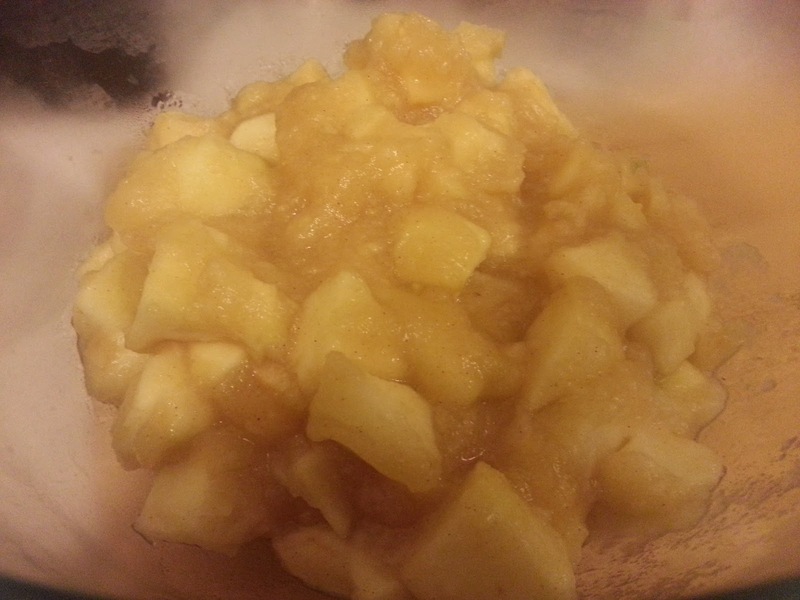 There will be apple sauce left over, so use them for more apple pies or even try making an apple danish or something. Chop the apples in to smaller pieces and maybe use brown sugar rather than caster sugar. Add a little lemon juice to the apples. Sprinkle a little sugar on the pies before baking, or dust with icing sugar after baking. Chill pastry for longer - I was very tight on time so rushed it slightly. Make sure the cutter I use for the top half of the pies is one size bigger than the base of the pies, to allow more filling to fit in. Add a knob of butter to the apples after cooking to mellow out the acidity. About 1KG of Bramley apples, peeled, cored and chopped into small pieces. 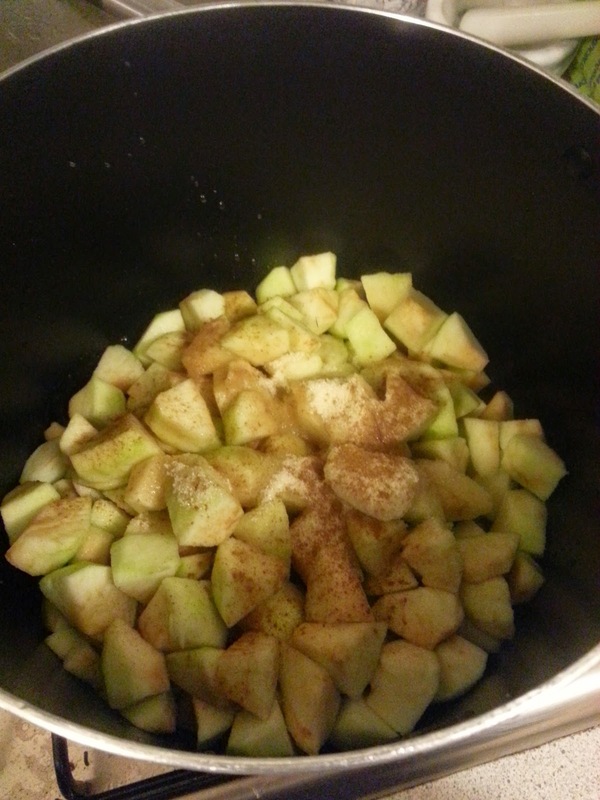 Put the Apples, caster sugar and cinnamon in to a large pot. Add a couple of tablespoons for water. Cover and cook on a low heat for 10 mins. Stir and replace the lid to cook for a further 8 minutes on the low heat. It will be ready when all the apples are very soft but careful not to make a pulp. Once it has cooked, take it off the heat and cool completely. Using a large cookie cutter cut discs out of the pastry. Using a small decorative cutter, stamp out the centre of half the discs. Spoon teaspoonfuls of the apple sauce in the centre of the base discs. Brush a little water on rim of the underside of the pie tops, place on top of the apple filled base. Press gently to seal and use a fork to further press it in place. Put the pies in the fridge for at least 30 mins. Brush the pies tops with egg and bake for about 25 mins. What was missing was some good creamy custard! Yum. Dude! No Custard? Wrong!!!! Look tasty though!